A one-page two-column smart CV template suitable for lots of roles. Subtle icons, vertical text and a crisp font give this template an eye-catching yet highly professional appearance. The soft grey bands are mirrored in the horizontal headers - while the vertical headers use expanded text for emphasis. 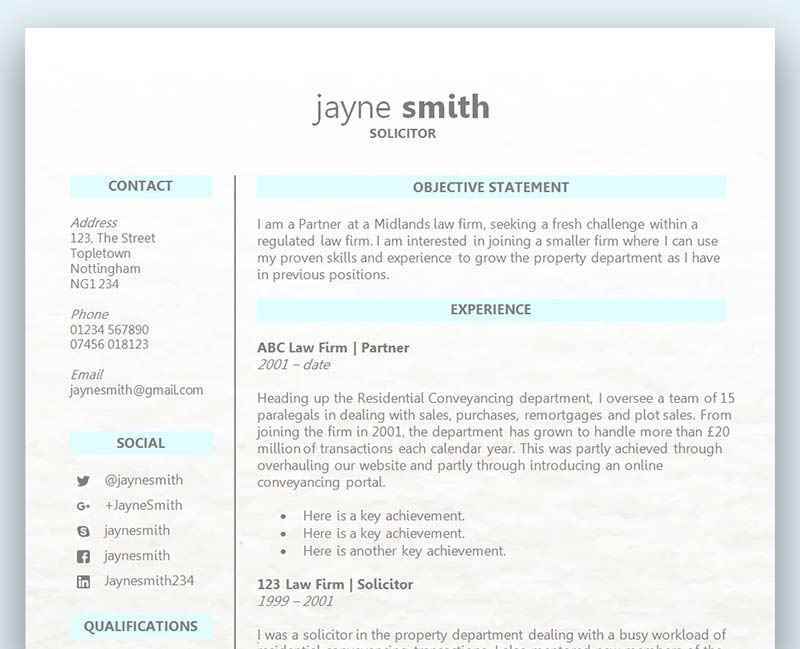 Plenty of white space and only the bare touch of graphics (used for contact icons) ensures this CV layout has a modern fresh appeal. Free Administrator CV template in Microsoft Word format	Overall rating:	4.5	out of 5 based on 14	reviews. This CV template uses tables - so it's a lot easier to edit if you turn on text boundaries. If you're not sure how, check out our CV template editing guide (below)! Be sure to install the required fonts before you open up your template to start editing (you probably already have Wingdings). We’ve all come across a job vacancy that we know we’d be great at. The problem is getting that message across to the employer, and making them believe in you. So how do you do that? Your CV is the only route to an interview and getting the chance in person to prove that you’re a worthy candidate. Writing an ‘OK’ or even ‘above-average’ CV might get you close, but will most likely result in rejection. Only a ‘great’ or ‘perfect’ CV will give you the best opportunity of coming out on top and getting the chance to explain yourself in person at an interview. Even just the tiniest of spelling mistakes could result in rejection – but why? Does it really matter to an employer if you make just the one error? Yes, unfortunately it does. An employer views a CV as one of the most important parts of the recruitment process – the second being the interview. Even just the one mistake shows a lack of care on your part, and failing to spot a mistake on a 2-3 page document is sloppy. This lack of diligence could easily spill over to the role, and accuracy will always play a large part in any position – especially if you are applying for a role which requires filling out important documents. If you didn’t check your CV before you emailed it, then we don’t have any sympathy if you get rejected based on any errors the employer finds. If however you do thoroughly check your CV before it goes out, you could still be leaving yourself prone to leaving a mistake. Our advice would be to have someone else proofread your CV. Having an extra pair of eyes to check over your spelling and grammar would be a more full proof way of ensuring it’s error free – and they may even be able to offer some additional tips. One of the worst things you can do when writing a CV is to make it generic. Although this might seem like a smart thing to do at the time when applying for multiple roles, you are going to struggle to show the employer that you really care about them. A generic CV won’t target the specifics of the role, and if the hiring manager has to read between the lines to see that you have the right skills and qualifications, you are likely to have a very hit and miss ratio when it comes to getting an interview – most likely miss! An employer is looking to hire someone who is passionate about the company and the role, and has made the effort to show this on their CV by tailoring it in accordance with the requests on the job advert. If you’re thinking that you can also get away with using the same CV for two different companies advertising the same job title – you’d also be wrong! No matter how similar the roles appear, every company is different. No two job adverts are the same, and with a slightly different skill set, a different company culture, different customers, and so on – you need to create two different CVs. Every CV you write should be tailored to the company, the industry, and the role. This will ensure that you’ve highlighted the relevant skills they’ve requested, along with the qualifications and experience. Make every section of your CV relevant to the employer, and make it obvious you are the right person for the job.